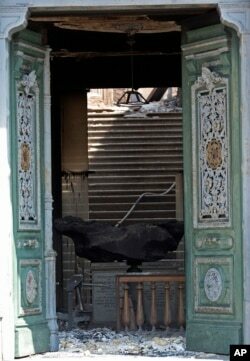 The National Museum stands gutted after an overnight fire in Rio de Janeiro, Brazil, Sept. 3, 2018. 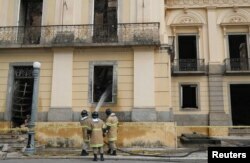 Firefighters spray water on the National Museum of Brazil after a fire in Rio de Janeiro, Brazil Sept. 4, 2018. A meteorite on exhibit at the National Museum is seen through a door after a fire in Rio de Janeiro, Brazil, Sept. 3, 2018. “I came here to give it back. I am sure there is much more that flew around,'' said Felipe Silva, who said he was a guard at the museum. 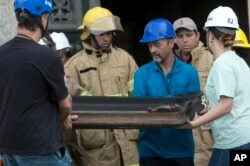 Firefighters and museum personnel carry away a burnt painting from the National Museum after an overnight fire in Rio de Janeiro, Brazil, Sept. 3, 2018. She added that UNESCO, the U.N.'s cultural agency, had offered financial and technical assistance. French and Egyptian officials also have offered help. The museum was home to Egyptian artifacts, and Egypt’s ministries of foreign affairs and antiquities have expressed concern over the fate of those objects.